The works shown below are by: Bibi Barba. Bibi Barba was born in Roma, central Queensland and has inherited the stories of her maternal grandmother, May. May grew up on Cherbourg Mission during the time of the Child Protection Orders and it was here that Bibi’s mother was born. In her later years May encouraged her grand-daughter to reconnect with her family’s country and people, the Birri Gubbi Nation from around Rockhampton. Bibi’s style is distinctive and dynamic. Her technique of embossing silk onto Belgian linen provides a lustrous bed for the desert and coral reef backgrounds to her paintings. Sometimes mixing sand with her acrylics, she layers the paint to create hints of mountains and sandhills over which she applies a web of connecting patterns. 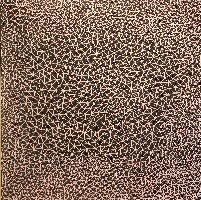 These abstract markings are reminiscent of the ancestral footprints in Tingari cycle paintings and the symbolic patterning of dotted waterholes in central desert paintings. Always connecting to one another, they refer most significantly to the eternal song lines linking Bibi’s people to their country and heritage. They cover but never conceal, the dry interior of Rockhampton’s hinterland and provide a shimmering sanctuary for life within the shallow waters of the coral reef. Painting is a process through which Bibi has reclaimed her heritage and through which she explores her personal relationship with her art. 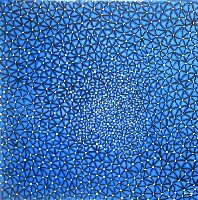 To view more Aboriginal paintings, please browse the ABORIGINAL ARTISTS section.